Actually, I think people are also quite sensitive to the derivative of acceleration, which is called jerk. This is why cars with a steep slope to the torque curve feel even faster than they are. Old school turbo cars like Evo and STI feel really fast compared to S55 in ZCP tune. This probably contributes to the feeling that the N55 is more lively at very low RPMs. Stock STI's and Evo's feel like turds. I'm not saying it cant make it from point a to b. But to think the m2 is the "right" car is just silly. I agree, it's certainly as capable as any other RWD car with snow tires. I did the same when I had my E46 and it did great. Better than a AWD car without snow tires even, but I'd hardly ever call it the right car. There are plenty MORE capable cars fit for the job, like a 4x4 Jeep Wrangler. You can feel however you want. Have you driven a M2c? That's the only way to know for sure. It's not for everyone. I have no interest in driving one. Perfectly happy with what I have and when I get rid of my M2, it won't be for another. I tend to try out different makes and models. If the M2C is comparable to an NA, then I can imagine what it's like. If the M2 is torqier at lower rpm's, I will most likely prefer the N55 anyway. So ya, it's just not on my bucket list to drive the M2C. The M2C doesn't drive like a NA car at all, but the powerband is more linear than the M2. Also the only time the M2 makes more torque is from idle to 2,700 RPM and that's only by about 20 WTQ. If you reread my original post, you can see that I never once argued that the M2C isn't superior. It seems the general consensus is that it is. What I said is that I don't see how it would add to the "average" driving enjoyment. And I stand by that statement. My Vette had 460 hp/465 tq. It was fun getting to the speed limit in 1 sec, but then what? Then it's just frustration because there's so much left on the table and you know it and you can't do anything about it without ending up with a ticket or in jail. Did I look cool going to my local grocery store? Like someone else said in another thread "I didn't look like a peasant". Looks-wise, the average person can't tell the difference between and M2 and a 230i. So that's not a reason to get one over an OG or lci. My point and experience with my M2 lci (which was just to share my opinion with the OP) is that I am perfectly happy with the lci and have never felt buyer's remorse knowing what the M2C has to offer. Especially with the price difference between the two that I would have been paying (used '18 vs new M2C). So tell me, how do the upgrades in the M2C make a better AVERAGE daily driver than the M2 lci? I'm not being snarky. Maybe I am missing out on something? Because I'm being honest when I say I haven't driven the M2C. My guess is you won't notice at all. Supposedly there are pretty significant chassis improvements, but it's not like you'd be comparing it to a 30yr old worn out car. Look at the graph again. The majority of street driving is 2,500-4,500 RPM on a day to day basis. 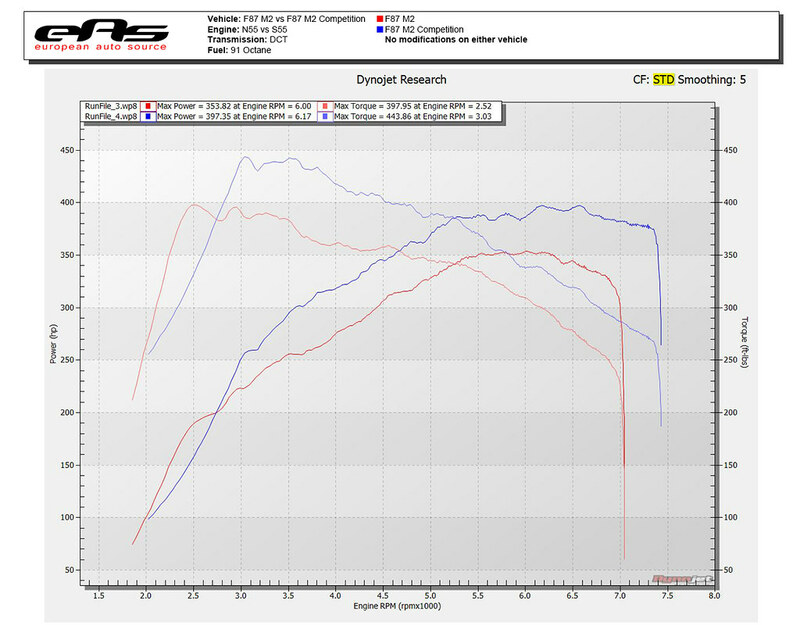 The M2C makes a lot more power and torque in the usable powerband, on average 60 whp and 40 wtq. Unless you're putting around at half throttle everywhere on your daily commute that is certainly noticeable. By your logic, If you are driving like a grandma you don't even need a regular M2, just buy a 230i or a Miata. A regular M2 is more than enough to rapidly reach go to jail speeds. Beyond the motor the brakes are also much sharper and responsive with the 2NH upgrade over the blue caliper setup, the steering weighting is also much better in the M2c and can be adjusted independently of the throttle. Last edited by CosmosMpower; Yesterday at 03:55 PM. Great response, thank you! So ya, maybe I would prefer the M2C if I drove it. I still won't lose sleep over it, though.